Good side of the game objective? helping your friends as I mentioned above - to earn you additional coins and experience for level up. 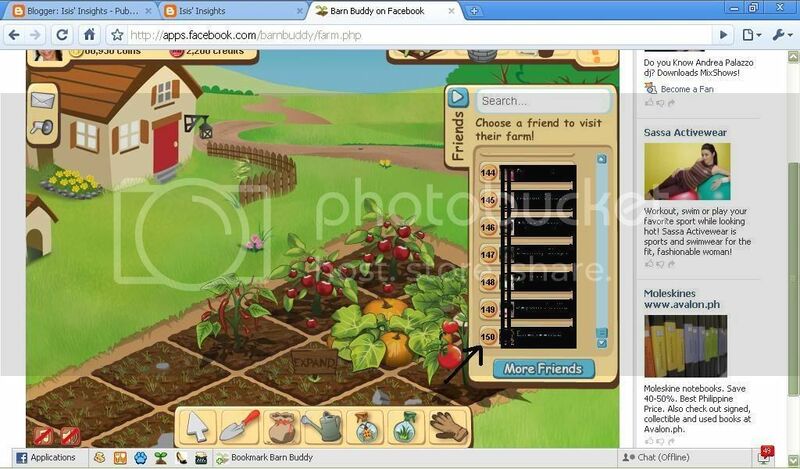 But, the bad side of barn buddy is that you can also steal from your friends' barn and earn the coins by selling the stolen fruits and vegetables. On the other hand, I was surprise that when I first started in barn buddy via invitation, my first harvest? almost all has been stolen, I think around more or less than 10 pieces left for me to harvest. And yes at first I thought of "this is just a game"
but on the other side of me is telling "it has a negative influence" but I was just confuse by the fact it is ONLY A GAME. Now, since my first harvest was few, I stop planting and left the game. Then after a day, I received notices from facebook that some of my foreigner friends -gave me some fruits! Actually most of them are the ones who stole my crops. Still I didn't mind. . . But the influence is that almost all of my friends are playing barn buddy and they explained that the most nicest part of the game are "the stealing and earning more coins". And told me a technique where you can harvest by using fertilizer that cost 50coins each (this advances 1 hour of growth in the plant). If your plants are less than a hour for harvest, put some fertilizer and tadah! You can instantly harvest. And so, this inspire me to continue the game barn buddy. Even though I knew the technique I can't accommodate it most of the times as I have mind (bugging) tasks, even if I use my cell phone reminder, I wouldn't notice it - as I'm concentrated on my tasks and when I do - I'll be totally away from the office noise or person beside me, I will see nothing except the computer monitor. Now, whenever some of my friends steal from me they chat me via YM after they have stolen, I don't mind the fact they stole from me cause when I have the time, I stole from them too and I'm thankful they reminded me to harvest (they understand I'm busy with my tasks) and at least ONLY my friends have stolen and not foreigners whom I don't know. And so there I continue to go with the flow. . . 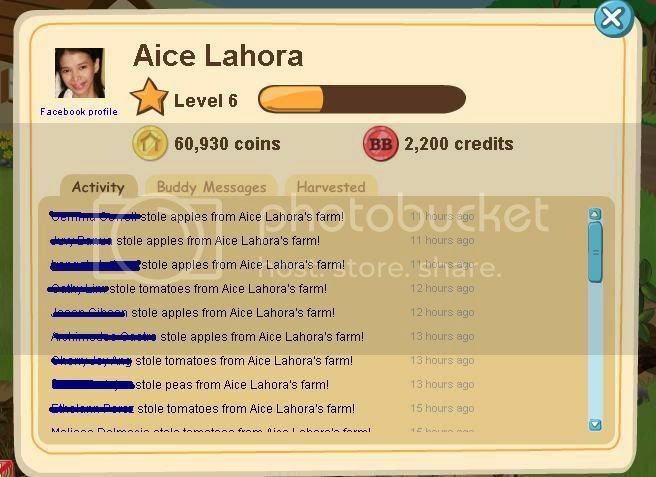 I earned more than 60k coins by stealing! Still my conscience is telling me about "what was written in the Ten Commandments?" and how the Devil will corrupt our way of thinking - little by little in any ways like what you called a "game" that has a negative influence. Think of it very carefully - As your friends stole from your barn (less harvest less earnings) and you need to steal too in order to gain coins (earnings that was stolen) to buy seeds and land for expansion of your own barn. And believe me, you have more earnings from stealing - than from harvesting (that was left to) your own barn, well if you leave your barn without checking you have zero as in NOTHING left to harvest. In my opinion - barn buddy is NOT good because everybody can steal your harvest to zero. Okay, there's an option to earn a dog (have 10 friends referrals) to guard your barn. Hmmm. . . sound a very good idea, right? I can't make it to 10 since most of the employees I know in our office are already playing barn buddy ahead of me. Geeesh! They have the dog and are already leveled up. Hmmm, I analyse the game interaction (flash) there is a bigger chance for cheat (again Bad influence) "Stealing". I even demonstrate to my seatmate this game can cause lag. why? What about the Dog? NO EFFECT! I do not see any good out of the stupid game called barn buddy. 2. Tell MyCropZ, the time you can login to facebook. And it will tell you the best type of seeds that you can grow in that duration.